Support club members who are raising funds for charity by competing in forthcoming events. Jim Whelan has set himself a challenge! In 2018 I am running three marathons starting with Brighton in April, followed by Edinburgh in May and Snowdonia in October. 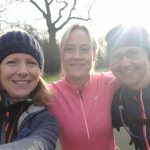 Having reached the age of 60 in good health and fitness I want to give something back and so I have decided to run three marathons and raise funds in memory of three people. Firstly, I want to mention my Mum who died of cancer in 2005. I ran my first Marathon, the inaugural Brighton Marathon in 2010 in Mum’s memory and in aid of Cancer Research. In April this year, I will be competing in the Marathon des Sables (MdS). This is six punishing marathons in six days across the Sahara Desert – one of the harshest environments on the planet. Covering over 150 miles of formidable terrain in 30-40ºC heat will, undoubtedly, be the hardest challenge I have ever done, or ever will do. Sponsoring me to do this will not only motivate me when the going gets tough (the training in itself has been incredibly tough to-date), but funds raised will go to support a fantastic charity, WALKING WITH THE WOUNDED (WWTW). WWTW rebuilds the lives of ex-service men and women through retraining schemes. Between 1,200 – 1,500, both physically and mentally injured service men and women, are being supported to achieve sustainable employment per year. In many cases, the charity supports homeless veterans and those unfortunately caught up in the Criminal Justice System. WWTW is an independent charity that relies heavily on individual fundraisers putting themselves through gruelling challenges, such as MdS, to raise the necessary funds to carry out the charity’s work. The funds I raise through running the MdS will go specifically to the Head Start Program – a scheme targeted at helping those with mental health problems resulting from their service. Mental health is emerging as a very real condition for ex-service personnel (many suffering in silence) with it all too often escalating into unemployment and homelessness. To put into perspective the enormity of the challenge that lies ahead of me, the MdS is ranked by television’s Discovery Channel as the toughest footrace on earth. From start to finish, it is 156 miles, with the longest stage being 55 miles in one day. The rules require you to be self-sufficient to survive. You are given a place in an 8-man tent to sleep at night and a daily ration of water, but all other equipment and food weighing up to a maximum of 15Kg must be carried.